After tracking Irene I came to think about another hurricane that made quite an impression on a six year old in mid October of 1954 when I was living in Passaic, NJ. I was in 1st Grade and recall being sent home early as the winds from Hazel began to affect northern NJ. By that evening the wind had increased to a loud roar and I recall the lights going out and our oak tree in the front of the yard snapping in half. 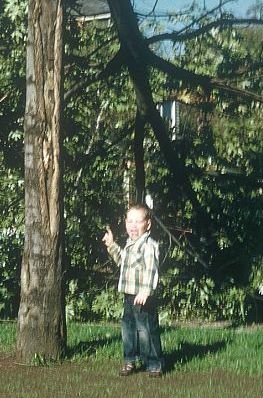 My brother Ed pointing to the downed oak tree in our front yard in Passaic, Nj. The first indication that a tropical cyclone had formed came ten days earlier on October 5th just 50 miles east of the island of Grenada in the Windward Islands just as the system was becoming a hurricane. (No satellite photos in those days). Hazel moved westward over the Caribbean Sea through October 8th before sharply turning northward under the influence of an upper level low that was situated over the western Caribbean Sea. By the 9th Hazel had intensified into a powerful Cat. 4 storm with max winds of 135 mph. Between October 9th and 12th Hurricane Hazel moved northward and even north- northeastward crossing western Haiti on the 11th leaving a death toll estimated to be between 400 and 1,000. As a result of the passage over Haiti, the maximum winds diminished to 100mph (Cat. 2) but after clearing Haiti, Hazel was once again over warm tropical waters and began to strengthen. Hazel gradually turned back northward passing over the southeastern Bahamas on the 13th then turned more northwestward on the 14th when hurricane hunter planes found Hazel’s maximum winds had increased to 150mph (high Cat. 4) and the center was now moving at a rapid 30 mph in response to a strong upper level trough moving eastward over the Mississippi Valley. Landfall occurred on the North Carolina/South Carolina border on the morning of October 15th as the system was starting to transition into an extra-tropical storm. The coastal area near the landfall was battered by winds estimated to have been as high 150mph. Winds of 98 mph were measured in Wilmington while winds were estimated at 125 mph at Wrightsville Beach and 140 mph at Oak Island. A storm surge of over 12 feet inundated a large area of coastline reaching as high as 18 feet at Calabash where the storm surge occurred at the time of the lunar high tide and Hazel nearly wiped out Garden City, SC. As Hazel moved rapidly inland, its winds only slowly diminished with a gust to 110mph reported at Fayetteville and 90 mph at the Raleigh-Durham Airport. Wind gusts near 100 mph were reported from numerous locations in Virginia, Maryland, Pennsylvania, Delaware, New Jersey, and New York as Hazel raced northward. Myrtle Beach, SC reported a peak gust of 106mph; Washington DC reported sustained winds to 78mph while peak gusts to over 90mph were reported far to the north in New York state. In New York City a peak gust of 113 mph was recorded at the Battery at the south end of Manhattan, however at the Central Park location the peak gust was reported at only 55 mph. Hazel finally weakened to below hurricane strength only as it passed north of the Canadian border. As Hazel continued northward it began to move into a cold air mass over Canada where it gave up a lot of its moisture resulting in devastating flooding in Ontario. Hurricane Hazel is the only recorded Cat. 4 hurricanes to hit North Carolina or any state further north. Hazel was responsible for 95 deaths and $281 million in damage in the United States, 100 deaths and $100 million in damage in Canada.